Abstract - We are exploring a new application of virtual and augmented reality for a novel direction in human-computer interaction named ‘cultural computing’, which aims to provide a new medium for cultural translation and subconscious metamorphosis. In this application both virtual and robotic agents are employed as an interactive dialogue figure. The main objective of this project is to create an interactive installation named ALICE that encourages people in Western culture to reflect on themselves, based on the narrative of ‘Alice’s Adventures in Wonderland’ which address issues such as logic, rationality, and self. Keywords: Alice in wonderland, cultural computing, experience, sub-consciousness. Developments in the field of Human Computer Interaction (HCI) have opened up a new direction for the application of computing technologies, including virtual and augmented reality. After the introduction of personal computing, cooperative computing and social computing, a new paradigm named ‘cultural computing’ has emerged . Cultural computing is based on what is called Kansei Mediated Interaction . Kansei Mediation is a form of multimedia communication that carries non-verbal, emotional and even subconscious information. “Through the effects of psychology and psychotherapy, the subconscious became an optional ontology through which individuals could reframe their lives. As such, it has become one of the most powerful artifacts of psychology” . First we have to introduce in our understanding and positioning of ‘culture’. Westerners and East Asians perceive the world, think about it and act in it in very different ways . Westerners pay primarily attention to some focal object, analyzing its attributes and categorizing it in an effort to find out what determinate its behavior. Determinates used mainly formal logic. Causal attributions tend to focus exclusively on the object and are therefore often mistaken. On the other side, East Asians pay primarily attention to a broad perceptual and conceptual field, noticing relationships and changes and grouping objects based on familiarities rather than categories. They relate causal attributions to the context instead of objects. Mainly social factors are directing the East Asians’ attention. They live in complex social networks with determined role relations. Attention to the context is more important than to objects for effective functioning. Westerners live independently in less constraining social worlds and attend to the object and their goals with respect to it. Physical ‘affordances’ of the environment can also influence perception but is assumed less important. The built environments of the East are more complex and contain more objects than those of the West. In addition, artistic products of the East emphasize the field and deemphasize objects. In contrast, Western art renders less of the field and emphasizes individual objects and people . Over the last several thousand the peoples of four distinct regions of the civilized world created the religious and philosophical traditions that have continued to nourish humanity into the present day: (1) Confucianism and Daoism in China; (2) Hinduism and Buddhism in India; (3) monotheism in Middle East; and (4) philosophical rationalism in Greece. ‘Monotheism’ and ‘philosophical rationalism’ is the religious and cultural foundation of the occident. We will use the term culture as the integration and synchronization of human behavior that includes attitudes, norms, values, beliefs, actions, communications and groups (ethnic, religious, social, etc.). An important expansion of cultural theories can be discussed as falling into four focal areas : (1) cultures as adaptive systems, (2) cultures as ideational systems, (3) cultures as socio-cultural systems, and (4) cultures as symbolic systems that are cumulative creations of mind. Conceiving culture as an ideational subsystem within a vastly complex system, biological, economical, social and symbolic, and grounding our abstract models and theories in the creation and usage of artifacts should make it possible to deepen the understanding of ourselves and our future. Whether the concept of culture has to be refined, radically reinterpreted, or progressively extinguished will probably not matter in the long run, unless we cannot find a way to ask the right strategic questions, identifying connections that would otherwise be unseen, and therefore to enable us finding the best answers for our cultural development. Cultural computing is more than integrating cultural aspects into the interaction with computers. It is about allowing the user to experience an interaction that is closely related to the core aspects of his/her culture. As such it is important to understand one’s cultural determinants and how to render them during the interaction . It can be confirmed that Westerners are analytic, paying attention primarily to the object and the categories to which it belongs and using rules, including formal logic, to understand its behavior . In contrast East Asians are more holistic, attending to the entire field and assigning causality to it, making relatively little use of categories and formal logic, and relying on ‘dialectical’ reasoning. These Western and Eastern types of cognitive processes are embedded in different I metaphysical systems and tacit epistemologies. It can be speculated that the origin of these differences is traceable to markedly different social systems as part of the underlying cultural determinants . For the Eastern and Western culture, the main value dealt with is enlightenment, but in different ways. Utilizing on modern technology, Nakatsu et al. try to give a new direction in form of “Kansei Mediation” to enable societies transforming towards enlightenment [also see 7]. Salem and Rauterberg  discuss the relationship of cultural computing and entertainment, and Hu and Bartneck  could conclude that “culture matters”. In the Eastern application, cultural computing is defined as cultural translation that uses engineering methods to represent essential aspects of a culture [6, 10]. These engineering methods, such as computer graphics, animations and mixed realities can give a person the sense of entering and participating in a different world. ‘ZENetic Computer’ is such an installation. It incorporates certain elements of the Japanese Zen culture (i.e., sansui paintings, poetry and kimonos). Through an interactive dialog with the system, users can experience the birth of self-awareness brought about through the unification of one’s everyday self and one’s unconscious self . The Zen teachings and symbols that are used in the ‘ZENetic Computer’ are very typical for the Japanese culture and are not likely to be understood by most people from the West. Therefore the question is how to create a comparable experience in the West that is based on symbols that can touch cultural determinates of Westerners. We tried to answer this question in the project named ALICE by proposing cultural computing based on the story of ‘Alice’s Adventures in Wonderland’ [1, 12-14], using a variety of technologies such as virtual reality, augmented reality, animated virtual agents and robotic agents. To support individual metamorphosis and therefore cultural developments by addressing subconscious layers we developed the ALICE installation to make core concepts of the Western culture consciously available for reflection and disputation. A number of well-known cognitive, emotive and behavioral techniques are available to address our main objectives including disputation of irrational beliefs, emotive techniques and behaviorally oriented assignments . One of the main therapeutic functions of our approach is to support, in all meanings of the term, the symbolic expression of subconscious processes and to try to make these processes intelligible: first, intelligible to oneself and then, from the knowledge acquired through one’s own experience, to others . In the role of Alice, the user goes through an interactive narrative and encounters six stages that are based on selected parts of the original plot. We will now embark on a walkthrough of all the six stages. The ALICE installation was build inside of a building of the Eindhoven University of Technology, which takes a space of 12 by 12 meter spanning two floors over a total height of 7 meters. The ALICE Installation consists of six consecutive stages. The visitor walks by him/herself through them, one after the other. Given the Western Culture’s emphasis on individuality, the installation is designed for individual experiences. It is not possible for a group of visitors to experience the installation at the same time. Fig. 1. 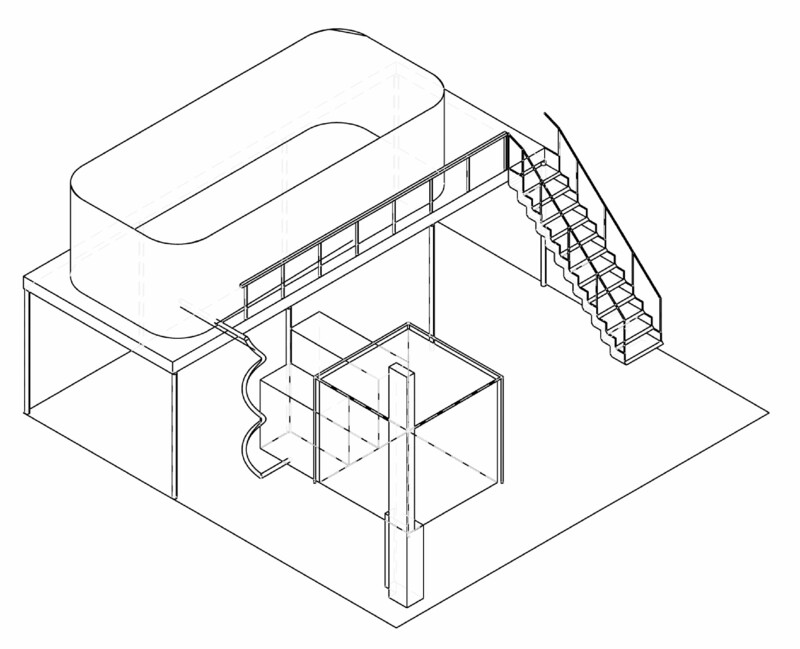 Schematic drawing of the installation. Fig. 1 shows a schematic drawing of the installation. Notice the panoramic room on top, the spiral rail for the electric seat and the CAVE in front. We will explain the function of each part in more detail within each of the corresponding stages. For each stage, we will first summarize the corresponding section of Carroll’s original story. Second, we will give an impression of the design of each stage, before we talk about its technical implementation. Last, we will describe the rationale behind each stage. It is likely that the Alice installation will have an effect on its visitors, but it is unclear what effects and how strong they may be. The visitors’ experience may range from being mildly entertained to a deeper psychological disturbance. The visitor of the ALICE Installation enters this stage through two curtains. Inside, a 360-degree panorama picture of Cambridge surrounds the visitor, the place where Carroll lived and worked. The panorama depicts a location in nature at the river Cam (see Fig. 2). The visitor has to wait until he/she is bored and thereby enters a similar state of mind as Alice in the original study. Then, a white rabbit appears from behind the curtain. It has a pocket watch and says through its internal speakers: “Oh dear! Oh Dear! I shall be late!” before disappearing into a rabbit hole at the far end of the room. On its way pass the visitor it tries to seduce the visitor to follow by starting a catch-me-if-you-can type of behavior. The rabbit enters a hidden section inside of the rabbit hole before the visitor enters the hole and hence disappears from sight. The visitor enters the rabbit hole after the rabbit and thereby enters stage two. Fig. 2. A visitor follows the rabbit. The panorama picture was printed on a large fabric. Several lights behind the fabric lighten the room and thereby giving the panorama the brightness of a summer day. The rabbit was build using a carbon fiber fabric, remotely driven by motorized wheels. A wide-angle video camera mounted in the ceiling allows to detect the positions of the rabbit and the visitor and hence to control the behavior of the rabbit accordingly. The first stage is associated with the concept of time. Fraisse  argued that “the more one pays attention to time, the longer it seems, with the extreme being expectancy which is nothing but expectancy of a desired or feared event. Reciprocally, duration seems short when the task is difficult and/or interesting.” This theory has been widely accepted and Feuerstein concluded that stress led to increases in subjective to objective time ratio and time following a period of stress was reported to pass quickly . More specifically, altered sensory environments have a complex influence on the perception of time . Visual and auditory stimulation interact in their production of an altered sensory environment that influences the cognitive timer. The concept of a cognitive timer is associated with Glicksohn’s Multiplicative Function Model of time . Several other models of time have been proposed, including Scalar Timing Model , Contextual Change and Attention Gating Models , Multiplicative Function Model Stimulus Complexity Model . A detailed discussion of the merits and differences between the models is not in the focus of this study and neither do we intend to propose a new model. Instead, we use Glicksohn’s model as a framework for the measurements of the visitors’ perception of time. His model appears to be most suitable for this study, since it was developed in association with an altered sensory environment. Alice falls down the rabbit hole in an unusual fashion. The speed of her fall is very slow and she is able to interact with objects that are attached to the walls of the rabbit hole, such as cupboards and bookshelves. The fall takes such a long time that Alice engages in a conversation with herself before dozing off. At last, she lands on a heap of sticks and dry leaves. 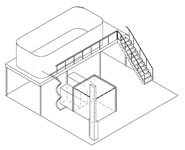 Stage two can be characterized by environmental space. Alice is discussing whether she can fall right through the earth and come out in New Zealand. She disputes the relationship of herself within the space of the earth. Fig. 3. A visitor descents through the rabbit hole on the electric seat. When entering the rabbit hole in the ALICE installation, the visitor finds an electric seat that is mounted on a rail. Once safely seated, the seat takes the visitor down a tunnel in spiral movement (see Fig. 3). Along the walls of the tunnel, cupboards, bookshelves and lamps are mounted. The speed of the electric seat is slow. The seat was build using a commercially available electric stair lift, commonly used in the houses of elderly to enable them to move from one floor to another. A remote controlled gate prevents the visitor to pass by the seat and thereby endangering him/her to truly fall down the rabbit hole. The seat is only activated once the armrests are put down, which prevents the visitor from falling off while moving. Infrared cameras are placed inside the rabbit hole to monitor the visitor. Since both, stage three and four are associated with the concept of space, we will discuss the concept in the next section. 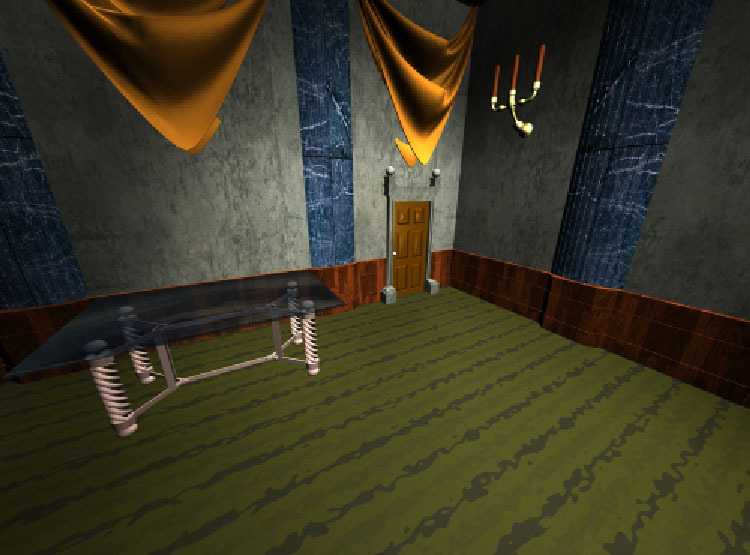 Alice enters a dark corridor with many doors, which are all locked. She approaches a glass table on which a small golden key lays. She uses the key to open a tiny door that leads to a garden, but Alice is too tall to enter. She approaches the table again, and this time she notices a bottle labeled “Drink Me” and later a little cake labeled “Eat me”. By drinking from the bottle she shrinks and by eating the cake she grows. Eventually she manages to have the appropriate size to enter the tiny door. Similar to stage two, stage three is associated with the concept of space. Clearly, we could not grow or shrink the visitors directly, but we were able to manipulate their relative size in comparison to the environment by using a 5 side CAVE. 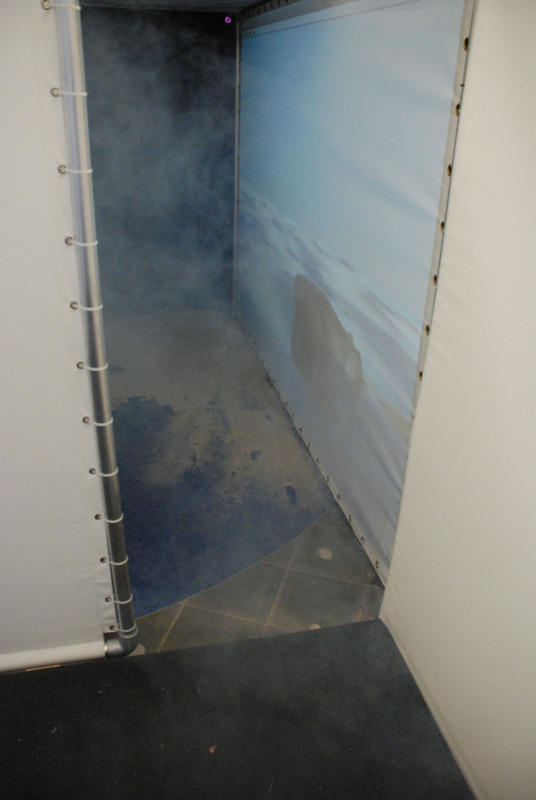 The visitor entered the CAVE and had the impression to stand in a virtual room. A cookies box labeled “Eat Me” and a bottle labeled “Drink Me” are placed on top of a small table (see Fig. 4). When the visitor drinks from the bottle, the virtual room enlarges, giving the impression that the visitor is shrinking. When eating the cookie, the virtual room shrinks, giving the visitor the impression that he/she is growing. On one side of the room, a door is shown. Once the visitor reaches the appropriate size, the wall on which the door is shown moves aside and thereby allows the visitor to enter stage four. Fig. 4. 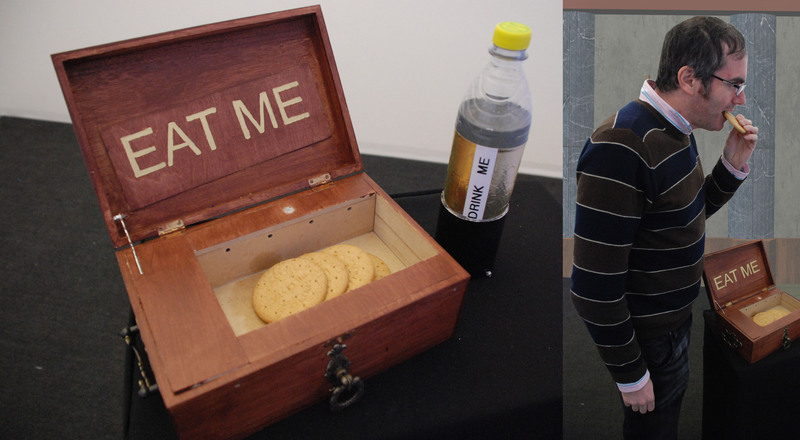 The virtual room(left), eat me and drink me (middle), Visitor eating the cookie (right). We used the Vizard VR Toolkit from Worldviz to synchronize the five projectors. The model of the virtual room was developed in 3D Studio Max. The floor of the cave is equipped with pressure sensors that allow us to determine the visitor’s position in the CAVE. Depending on his/her location, the perspective of the projection is adjusted to give a true 3D impression of the virtual room. The bottle features touch and tilt sensors to detect drinking. The cookie box is equipped with a microphone that allows us to detect the visitor’s chewing sounds when eating the cookie. Both, stage three and four, deal with space. Stage two can be characterized by environmental space, while stage three is associated with personal space. In both stages the relationship between the visitors’ and the installation’s space is of essence. This relationship can be described within the well-established framework of Presence. Presence is often referred to as a subjective experience of being in one place or environment, even when one is physically situated in another. It is an illusion of “being there”, “it is here” or “being together” [24-26]. During her growing and shrinking experience, Alice cries many tears. When she walks through the tiny door she enters a pool of tears. She talks to a mouse that swims alongside her and together with some other animal they finally reach the shore. When the visitor enters stage four, the sea with a mouse in it is projected on one of the walls (see Fig. 5). In addition, a smoke machine creates an impression of moisture and adds a mystical feeling to this stage. The visitor walks along the projection and thereby enters stage five. Fig. 5. Stage four, with an animated agent. At the beginning we were discussing building a real pool, but it was not clear what the visitors would do with their clothes. Hence we created a virtual pool of tears with the use of back-projection. The animation of mouse in the water was created in 3D Studio Max. The symbolic interpretation of this stage remains difficult. A possible symbolism could be the Christian ritual of baptizing. The caterpillar engages Alice in discussion about herself. It asks Alice who she really is and how she wants to be. 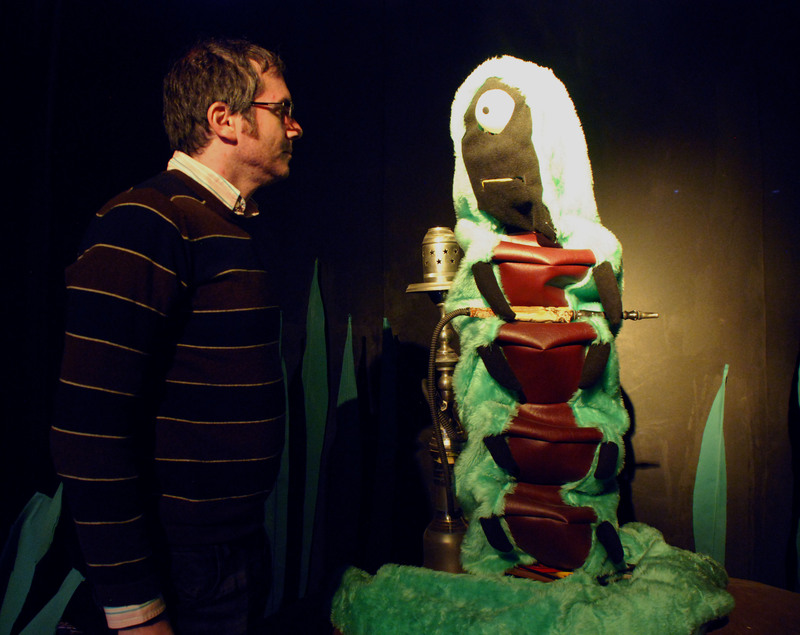 The complete episode is a dialogue and hence we created a robotic caterpillar to engage the visitor in a similar dialogue (see Fig. 6). The caterpillar is a robotic agent that features a microphone array [27, 28]. These microphones record the utterances of the visitor but also detect the relative position of the visitor. The body and the head turn to the visitor when the caterpillar speaks to the visitor. A dialogue system manages the conversation. Fig. 6. A visitor talking to the caterpillar, a robotic dialogue agent [27, 28]. This stage can be associated with the concept of the self. Throughout history, there have been wide varieties of theories about the self, coming from the fields of philosophy, psychology, and religion. This includes assertions that there is no self; that the idea is a logical, psychological, or grammatical fiction; that the sense of self is properly understood and defined in terms of brain processes; that it is merely a constructed sociological locus, or the centre of personal and public narratives, or that it belongs in an ineffable category on its own . There is a significant difference in the construction of the self when comparing European/American culture and the Japanese culture [30, 31]. Western middle-class cultures are generally organized according to meanings and practices that promote the independence and autonomy of a self that is separate from other similar selves and from social context. This resulted in a prevalent self-esteem among western people with a tendency to self-enhancement. In contrast, many Asian cultures do not highlight the explicit separation of each individual, promoting the fundamental connectedness among individuals in a social group. The result of this on the construction of the self is that they are more likely to engage in self-criticism instead of self-enhancement . Among con-temporary researchers in social cognition, distinctions are drawn among self concept (cognitive component), self-esteem (affective component) and self-presentation (behavioral component) . By addressing the Western individual self-concept, Alice’s self is challenged in ‘Advice from a Caterpillar’. After she entered the rabbit hole to follow the White Rabbit, she experienced a lot of transformations both physically and mentally. This brought her in an initial state of confusion, which is emphasized in her conversation with the Caterpillar: ‘Who are YOU?’ This challenging attitude of the Caterpillar makes Alice uncertain about herself, becoming vulnerable and open for persuasion . Such a situation gives the possibility for a confrontation with and stimulates awareness of the self-concept. The character symbolized as a caterpillar is well chosen. One of the most important characteristics of caterpillars and butterflies is their unique life cycle. One of nature’s most mysterious metamorphoses occurs when a caterpillar changes from a slow-moving, fat and ugly creature to a colorfully winged, beautiful butterfly. This metamorphosis happens to a lot of insects, but not as dramatically as it does to a butterfly . In this respect the ‘caterpillar’ character can unconsciously pursue the message to a human user not to be afraid of a fundamental metamorphosis in his or her self-concept. This symbolic meaning can counterbalances the challenges intended by a conscious dialog next to it. The Cheshire Cat involves Alice in a dialogue about logical reasoning and madness. During the dialogue the cat disappears at times completely and sometimes only its grin remains visible. This episode of Carroll’s book is predominantly a dialogue. In contrast to the previous stage, we did not use a robotic agent, since the transformations of the cat are impossible in reality. 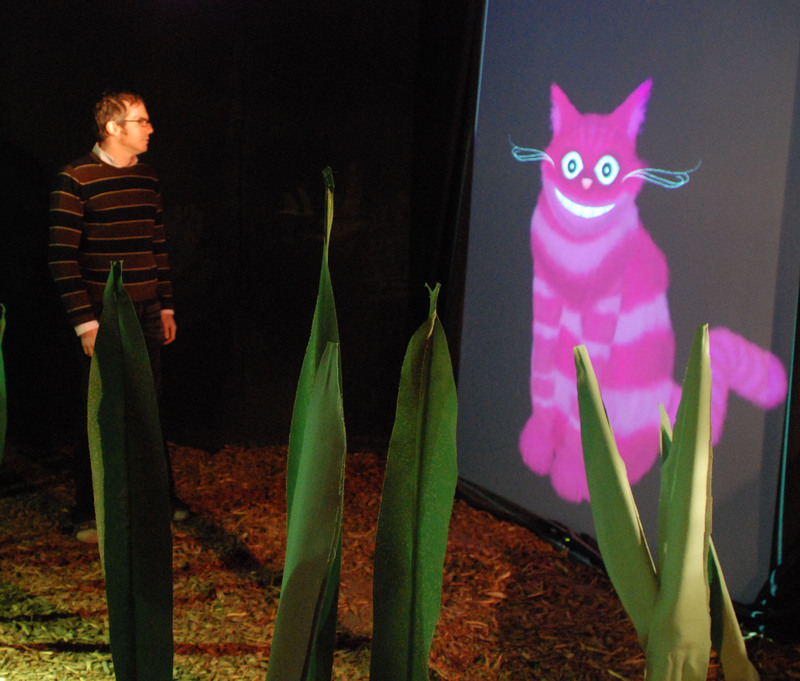 We therefore created an animated virtual Cheshire Cat that is projected on a screen, which augments the grass surroundings. When the visitor approaches the cat, it engages him/her in dialogue similar to the one in Carroll’s book. Again a microphone array is hidden next to the screen to record the visitor’s responses and to detect the position of the visitor. 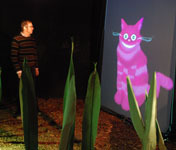 Adobe Director is used for the animation of the cat and the dialogue management. Similar to the Caterpillar most of the questions and statements are metaphysical or mystical. The necessity of logical reasoning is the topic of the last stage. Generating alternatives is a key component in human reasoning  hence we use the Alternative Generation Task originally proposed by Torrens et al. . After the visit, visitors are asked to create as many diagrams as they can think of to visualize a multiple model syllogism. Their responses are scored in terms of the number of different but correct diagrams produced. Fig. 7. A visitor talks to the Cheshire Cat. In the Alice installation, every stage has its own requirements on the setup and employs a different set of technology – from animated virtual characters to physical robots; from CAVE based virtual reality to augmented reality; from still image prints to simulated real environments. Every stage uses one or more computers, connecting to different type of microcontrollers or hardware interfaces that are again connected to a variety of sensors and actuators. Many programming languages were used, such as C++, Java, Python, JAL, and ActionScript, since different stages were designed and created by project members with a different background and expertise. It is a challenge of its own how these software and hardware bits and pieces can be structured together into one automated system that brings the visitor a smooth and holistic experience. Fig. 8. Distributed PAC over Channel connections. A multi-layered, multi-agent based structure is designed based on the distributed architecture proposed , in which PAC (Presentation-Abstraction-Control) agents [38, 39] are distributed over a network and connected through so-called Channels (see Fig. 8). In this architecture a channel generalize the data and control communication among agents. In Fig. 8, the channels are depicted by a straight line connecting a data supplier (●) and a data consumer (○). The agents at every level have actuators (■) presenting data to the environment and sensors (□) detecting the input from the environment. Applying this structure to the Alice installation results in a three-layer structure depicted in Fig. 9. At the top level is the central controller that coordinates the stages based on a scripted scenario. 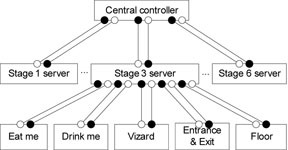 Every stage implements a stage server that updates the central controller with the local states and interaction events and receives the commands from the central controller. At the bottom level are software components (for example Vizard in Fig. 9), or programmable hardware interfaces that are directly connected to sensors and actuators. 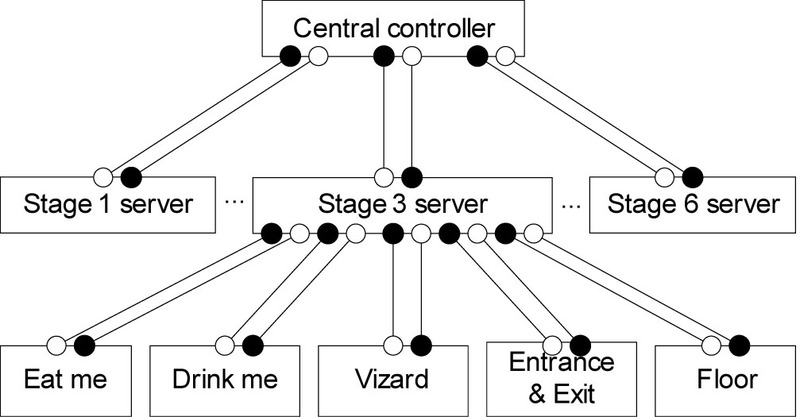 The stage servers coordinate their bottom level agents and hide the local complexity from the top level controller. The channels between the bottom level and the intermediate level are mostly implemented over USB or serial cable connections or over Bluetooth radio. The channels between the central controller and the stage servers are implemented over TCP/IP network connections. An XML based communication protocol is designed and implemented directly on top of TCP/IP, to ensure the minimum requirement on the software packages or programming languages used by the stage servers. This structure enables the ALICE project to decompose the complexity of the entire installation into loosely coupled stages, and to organize the project in a similar hierarchical manner that distributes the tasks in smaller teams and coordinates the progress at a higher level. We have introduced and discussed a new application of virtual and augmented reality, together with virtual and physical agents, for the novel research field of cultural computing. We described the six stages of our installation, taking into account the corresponding part in Carroll’s original book ‘Alice’s adventure in Wonderland’. We presented how these stages are translated into the visitor experience, which the technologies are used for the translation, and which intended effects are for each stage on the visitors. Overall, we believe that the ALICE installation can be seen as valuable contribution to cultural computing by providing access to the subconscious determinates of the Western culture. Yet we are looking forward to measuring the effect of the installation on the visitors by using a mixture of conscious and subconscious psychological tests. This will then reveal the full potential of Alice’s wonderful story which remained in the public attention for already over 140 years. This project is sponsored by Microsoft Research in Cambridge, UK. We want to thank Tijn Kooijmans, Sjriek Alers, Chet Bangaru, Geert van den Boomen, Ton van der Graft, Dirk van de Mortel, Peter Peters and Christoph Seyfert for their valuable contributions to our project. Salem, B., & Rauterberg, M. (2005). Aesthetics as a key dimension for designing ubiquitous entertainment systems. Paper presented at the The 2nd International Workshop on Ubiquitous Home - ubiquitous society and entertainment. Retrieved. Rauterberg, M. (2006). Usability in the Future - Explicit and implicit effects in cultural computing. Proceedings of the Mensch & Computer 2006: Mensch und Computer im StrukturWandel, München, pp 29-36. Rauterberg, M. (2006). How to assess the user's experience in cultural computing. Proceedings of the Usability Professionals 2006, Broomfield, Colorado, pp 12-17. Feuerstein, M. (2003). Effects of Stress and Relaxation on Time Perception. PhD Thesis, Uniformed Services University of the Health Sciences, Bethesda. Gibbon, J., & Church, R. M. (1984). Sources of variance in an information processing theory of timing. In H. L. Roitblat, T. G. Bever & H. S. Terrace (Eds. ), Animal Cognition (pp. 465-488). Hillsdale: Erlbaum. Block, R. A. (1985). Contextual coding in memory: Studies of remembered duration. In J. A. Michon & J. L. Jackson (Eds. ), Time, mind, and behavior (pp. 169-178). Berlin: Springer. Flaherty, M. G. (1999). A Watched Pot: How We Experience Time: New York University Press. Slater, M., Linakis, V., Usoh, M., & Kooper, R. (1996). Immersion, Presence and Performance in Virtual Environments: An Experiment with Tri-Dimensional Chess. ACM Virtual Reality Software and Technology (VRST), 163-172. Schuemie, M. J., van der Straaten, P., Krijn, M., & van der Mast, C. (2001). Research on Presence in VR: a Survey. ACM Virtual Reality Software and Technology (VRST), 4(2), 335-341. Kooijmans, T., & Rauterberg, M. (2006). Advice from a Caterpillar: an Application for Cultural Computing about the Self. Proceedings of the 5th International Conference on Entertainment Computing (ICEC), Sanda, pp 5-8. Gallagher, S., & Shear, J. (Eds.). (2000). Models of the Self. Exeter: Imprint Academic. Brehm, S. S., Kassin, S. M., & Fein, S. (2002). Social Psychology Boston. Houghton Mifflin Company: Boston. Heiligman, D. (1996). From caterpillar to butterfly. New York: Harper Collins. Newstead, S. E., Thompson, V. A., & Handley, S. J. (2002). Generating alternatives: A key component in human reasoning? Memory & Cognition, 30(1), 129-137. Coutaz, J. (1997). PAC-ing the Architecture of Your User Interface. Proceedings of the 4th Eurographics Workshop on Design, Specification and Verification of Interactive Systems, pp 15-32. Coutaz, J. (1987). PAC, an Implemention Model for Dialog Design. Proceedings of the Interact'87, Stuttgart, pp 431-436.